How do I set my humidistat when I go away for the summer? How do I set my Humidistat when arriving to Venice? What do I set the fan to on my thermostat? Setting the fan switch to AUTO runs the indoor fan only when there is a call for cooling or heating, in this position the fan will turn off after the temperature is satisfied.In this setting your house will stay the driest during the cooling mode. Do you offer financing for new ac unit? Click here to fill out a secure application, and we will contact you quickly about the next step in replacing your old unit, its that easy! Do you offer $49.95 Tune-ups? No but will be fix their $49.95 tune-ups. Why is does my thermostat show aux or auxiliary heat sometimes? When auxiliary heat is displays on a thermostat, the thermostat is notifying the user electric heat or second stage of heating for a heat pump system is on. If the temperature is set 3 degrees warmer than the house temperature then it is usually normal to see this display. 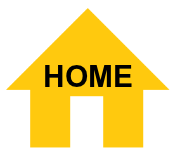 Additionally on most digital heat pump thermostats the auxiliary heat will be timed to come on if the call for heat is extended. While it is normal to see the Aux. heat during a high heat demand, prolonged running the system,lukewarm air, and auxiliary heat display constantly on may indicate there is a problem with the outside heat pump. What is the best a/c filter. There is no simple answer to this. The best air filter will catches the most particles in the air while letting the proper air thru them so the ac equipment can do its job properly. Paying more for an air filter at the hardware store may not be in the best interest for the performance and life of an air conditioner. Generally every month to six months, It varies with location of air intake and how much activity is in the home. If a return is close to the floor the filter gets plugged faster than if it was located at the ceiling. Homes with lots of activities and pets will need filter changes more often. How fast can you come out to fix my ac. We will come out the same day you call, usually within 4 hours if not sooner! Trane is made in the USA, specifically at Tyler Tx, Vadaila Ga. Most of Carrier residential equipment are manufacture in Mexico. Why does my A/C drip water? It could indicate the drain line is partially clogged, drain pan cracked, water blowing off evaporator coils, condensation forming on cabinet during humid days, incorrectly pitched drain line, duct leaking, undersized return or supply ducts, frozen evaporator coil, air handler not level, would be a few reasons why. The best way to determine why it is leaking is to have Venice Cooling perform a diagnostic call for $96.00. What is the weather in Venice Florida? 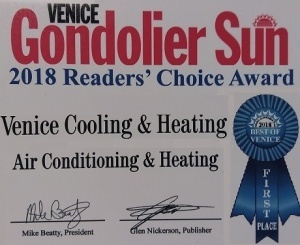 Voted 2018 Best Venice AC Company.